The production of sufficient amounts of high quality food in a socially and ecologically sustainable way is one of the central challenges of mankind. Beside plant pathogenic microbes, aphids and cereal leaf beetles can lead to pronounced yield losses and are therefore the most important pests in cereal fields in Europe. They are attacked and to some extent regulated by parasitic wasps and arthropod predators (mainly beetles and spiders). Both, pests and their natural enemies are influenced by cultivation practices such as the amount and type of fertilisation. In this project, the effects of fertilisation type on the species community (diversity, abundance and biomass) of invertebrates and plants were investigated together with pupils in cereal fields. 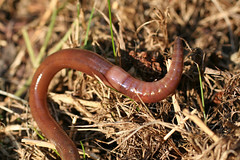 Earthworms play a central role in belowground ecosystem as they provide important services, such as decomposition and bioturbation, thus supporting soil fertility. Therefore, they also played a central role in the present project. The development of a molecular species identification system allowed assessing and characterising the community of these important soil animals without the necessity of killing them for the analysis. Fertiliser induced shifts in functional groups of invertebrates were recorded, and a barcoding DNA sequence database was established for the respective animals. Fertilisation effects on plants were determined via factors such as growth rate and yield of cereals, weed cover and the presence of plant pathogenic fungi in the field. All those results supplemented the findings of an ongoing scientific project financed by the Austrian Science Fund (FWF P26144) and contributed to a comprehensive functional understanding of the effects of fertilisation type on the species community in cereal fields. The cooperation of pupils and teachers from two schools (BRG in der Au in Innsbruck and HLFS Kematen) together with scientists of the University of Innsbruck enabled the kids to work on topical questions of fundamental research and fosters their enthusiasm for science.